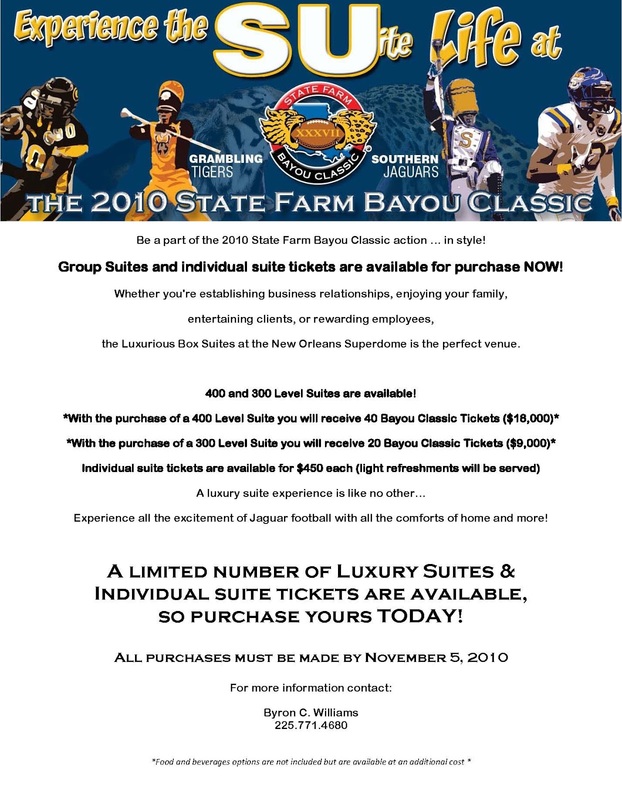 Group Suites and individual suite tickets are available for purchase NOW! 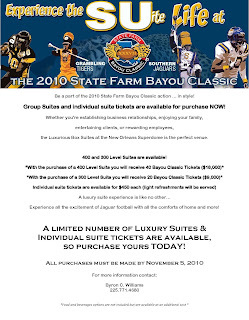 Bayou Classic group and individual suite tickets are available for purchase NOW! Mayor-President Kip Holden recently announced plans to beautify the city of Baton Rouge. Students from Southern University and Louisiana State University have designed, and will take charge in executing the two beautification projects. According to a plan created for The Green Light Beautification Program, students from Southern University's School of Urban Forestry will work on one project while LSU Robert Reich School of Landscape Architecture students will work on the other. Each of the projects will cost $50,000 to complete. Students from Southern University will improve the median on North Acadian Thruway between Winbourne and Chippewa Avenues by planting several southern live oak, bald cypress, and red maple trees. 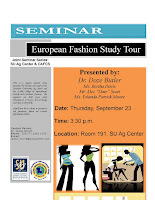 They will work under the supervision of Dr. Kamran Abdollahi, SU Ag Center scientist. The LSU students will plant a rain garden at the I-10/Dalrymple interchange at the LSU Lakes, to replace the current lawn area, and other rain gardens along the lakeside to cleanse the storm water running into the lake. The Green Light Plan was created to improve traffic for the city, and a portion of the funding was set aside for a physical facelift in some areas, creating the Beautification Program. In the last two years, the program has completed several beautification projects including the areas of Ashley Place on Marque Ann Drive, Melrose Place, The Lakes at Highland on Burbank Drive, Gus Young Avenue, and Corporate Boulevard. Fall army worms are on the march in Louisiana, and heavy populations are causing major damage to lawns across the state. No lawn grass is immune to their attack. Fall army worms can have up to four generations per year in Louisiana, and each generation takes about a month to complete its life cycle from egg to adult moth. In epidemic years, heavy moth flights can result in overlapping generations. The larva or caterpillar stage lasts two to three weeks. The full-grown larvae are about 1-1.5 inches long, brown to green in color, with a prominent, inverted Y on the front of the head. They are called army worms because they move together in large numbers, just like an army. Large caterpillars can devastate a turfgrass lawn’s foliage in just a few days. Areas affected by army worms in lawns may start small but rapidly expand in a few days. Damage resembles major scalping with a weed eater or lawn mower. Grass will grow back, but recovery will be slow. The damaged areas will be more susceptible to disease invasion this fall. In urban areas, homeowners can treat their lawns when fall army worms threaten turf establishment or survival. Bermuda grass is normally the most susceptible lawn grass. Major infestations and damage have been found in Centipede grass and St. Augustine grass in the past month. Insecticides recommended for control of insects on lawns are Acelepryn, Azatin XL, Battle GC, Mach 2, Lepinox WDG, Conserve SC, Talstar 10WP, Dylox, Condor XL, Crymax and Sevin. Today, Southern University is among the nation’s 18 Historically Black Land-Grant Universities because of the legislation introduced by Vermont Representative Smith Morrill in the “Agricultural College Act of 1890” as part of the Morrill Acts. The Morrill Land-Grant Acts allowed for the creation of land-grant colleges. The first Morrill Act was passed in 1862, and the second in 1890 to establish black land-grant colleges. The bill did not pass until Morrill proposed that the institutions would teach military tactics, engineering and agriculture. In Washington, D.C., Agriculture Secretary Tom Vilsack announced five new inductees into the USDA Hall of Heroes, September 15. Established in September 2000, the USDA Hall of Heroes recognizes those that have had a lasting impact on agriculture and related programs. These leaders – both past and present – receive a permanent tribute for their contributions to agriculture. This year’s honorees include Justin Smith Morrill, Norman Berg, Thomas Monroe Campbell, Senator Tom Harkin, and Senator George McGovern. "Each of these individuals has dedicated their public and private lives to improving various facets of food and agriculture," Vilsack said in a statement. "As a result, rural communities are stronger, people in America and throughout the world have abundant food, kids have access to more nutritious meals, and our public and private lands are better conserved. It is an honor to recognize and pay tribute to those who have contributed greatly not only to USDA, but also those who live in this great country." Justin Smith Morrill (1810-1898) acted as the driving force behind the College Land-Grant Act, the legislation which laid the framework for the highly productive, science-based agricultural systems still in place today. This legislation, known as the Morrill Acts, is complete with two governing principles: the equality of opportunity and the utility of knowledge. The Land-Grant Acts helped set up the Nation's system of land-grant colleges, providing public land to each state that financed Agricultural Education. The second Morrill Act required that no funding be distributed to any state that differentiated education on the basis of race, or that did not issue funds equitably to parallel institutions. Norman Berg, Thomas Monroe Campbell, Justin Smith Morrill, and Senators Tom Harkin and George McGovern have their names added to plaques featured at the Jamie L. Whitten Federal Building in Washington, D.C.
A seminar entitled "European Fashion Study Tour" will be presented by Dr. Doze Butler and three students on Thursday, September 23 at 3:30 pm in A.O. Williams Hall, room 191. Please see attached flyer. Hope to see you there. Thank you. Across Louisiana, there remains a need to improve the quality of life especially for residents with limited resources. This is where the Southern University Agricultural Research and Extension Center steps in with its team of specialists to enhance the conditions of limited-resource and underserved families, businesses and farmers. Southern University was among the top universities that captured the highest number of 12 funded projects and placed fourth in the funding amount of $2,881,820 in the Capacity Building Grant Program. On September 9, Agriculture Secretary Tom Vilsack announced that 18 Historically Black Colleges and Universities received grants from the U.S. Department of Agriculture to strengthen their research, teaching, and extension capabilities. Grants totaling more than $50 million were awarded through the department’s National Institute of Food and Agriculture which supports historically Black institutions designated as land-grant universities. This year, the institute awarded $32,514,064 through the Capacity Building Grants Program and $18,979,200 through the Facilities Grants Program to the 18 institutions. Back-to-School Summit. Theme: "Healthy Youth-Healthy Future." 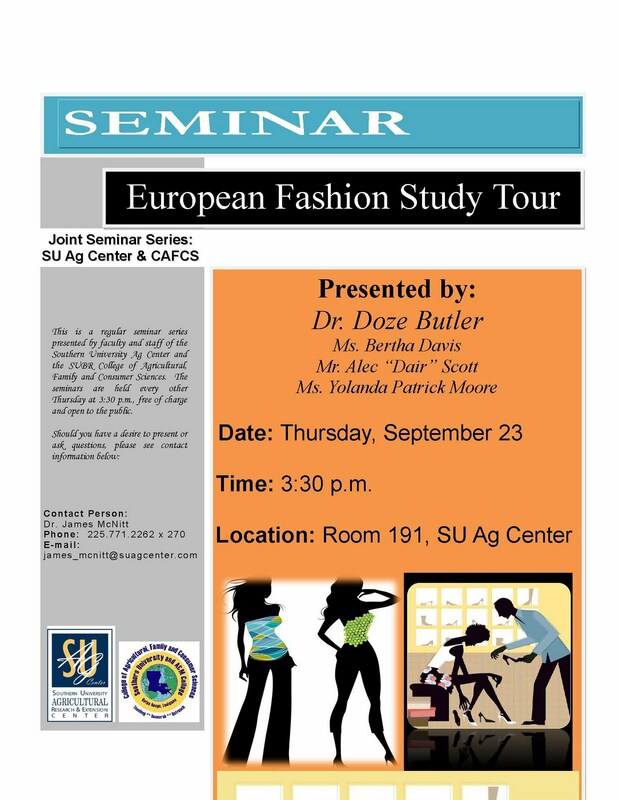 Event Description: This parish-wide event for 8th graders is a collaborative effort between the Southern University Agricultural Research and Extension Center- through its Southwest Center for Rural Initiatives, the Louisiana Department of Education, and 40 other non-profit organizations, state agencies, local municipal governments, and businesses. This year’s speakers include: DEN HUSSEY, Motivational Speaker; Danna Andrus, “Dr. Truth”; RANI WHITFIELD, MD “Tha Hip Hop Doc”; HOLLIS CONWAY, Two-time Olympic Medalist; and BYRON STARKS, Coach & Mentor. Secretary of Agriculture Tom Vilsack announced the appointment of members to Beginning Farmer Committee on August 12. Out of the 11 appointees, two of them are members of the SU Ag Center Small Farmer Agricultural Leadership Institute. Luciano Alvarado of North Carolina is a graduate of the 2nd class and Frances Benton Gibson of South Carolina is a member of the Institute’s 3rd class. “One of the primary goals of the Leadership Institute is to develop leaders and advocates for the small farm community, and I am of the opinion that both of these individuals will be excellent representatives,” said Dawn Mellion-Patin, Agricultural Specialist and Institute program director.